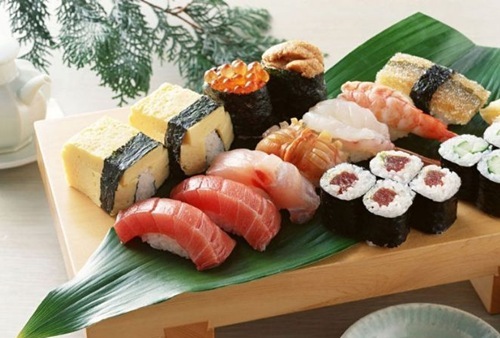 In Japanese cooking the sushi (Sushi / Sushi / Preserved fish sushi) is a food fish, algae, plants or eggs. The filling may be raw, cooked or marinated and can be dispersed served in a bowl of rice, rolled into a strip of seaweed or disposed in rolls of rice or inserted into a small pocket of tofu. Sushi prepared by mixing sugar with salt, vinegar and sake. Put the boiled rice still warm in a bowl, pour the sauce and mix. Beat the eggs and cook them in a pan with a little oil, forming two thin pancakes. Let them cool and then cut into strips. Boil the shrimp for a few minutes in boiling salted water, shell them and cut them in half lengthwise. Cut the flesh of the fish into thin slices and diagonal. Clean the ginger and cut it into thin slices let it rest covered with vinegar. With your fingers work the rice forming into balls of about 6 cm diameter, then place them in a serving dish. Garnish each ball with a slice of ginger, put on the plate also shrimp and slices of fish flesh and serve accompanied with soy sauce.